Trends, collections, fashion week(s), style blogs, street style, fashion magazines, makeup looks, designers…and where am I going with this list? Well, there is one major component that all of these have in common—they create an image. And that is why we love fashion and beauty after all, because it allows us the opportunity to admire something beautiful. So today I want to dedicate this blog to some fascinating fashion and beauty images. Obviously this blog is not about politics, and I surely don’t intend to get into any sort of political conversation or debate. 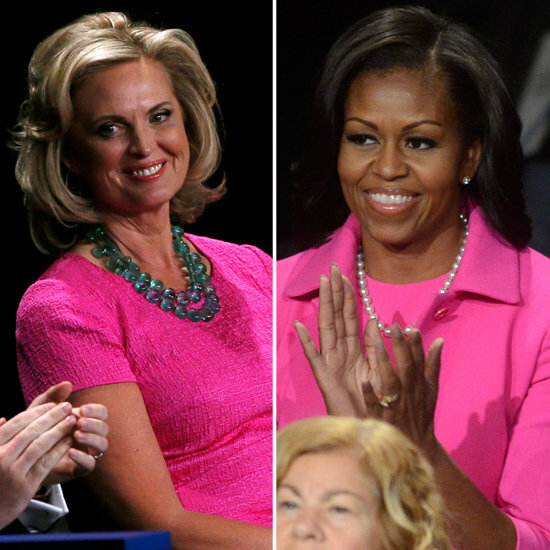 Rather can we just say how lovey both wives looked at last night’s debate in this pink color? You can imagine the immediate fanfare on the Interwebs. I’m loving First Lady Michelle Obama’s jacket and Anne Romney’s green necklace choice! W magazine is celebrating its 40th anniversary with four different covers meant to pay tribute to each of the decades. Gwyneth Paltrow is unquestionably one of the most beautiful women in the world, and it is probably equally fair to say that she rarely takes a bad picture, but I especially love this one from the Annual Golden Heart Awards. That dress is killer!